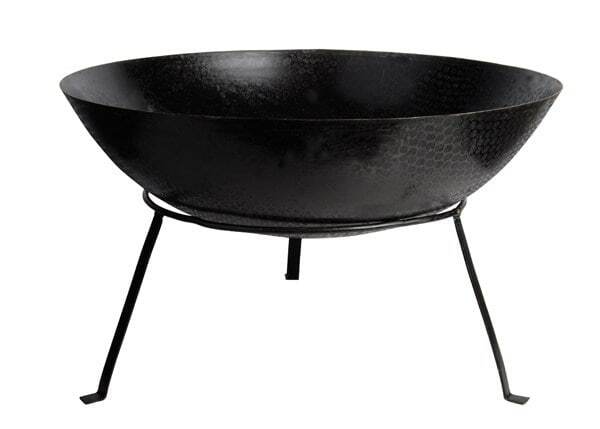 Buy Steel fire bowl: This brazier fire bowl has a simple design which will hold a good sized fire. It is made from mild steel and is built to last.<br><br>Measurements:<br>Ø59cm x H55.5cm<br><br><b>Warning:</b><br>For outdoor use only. Keep children and pets away from the fire bowl when lit. Always position away from buildings on a safe non-flammable surface. If using on a paved patio, place on an additional protective paving stone made from solid natural stone or concrete at least 5cm thick. This will avoid possible discolouration and cracking of your patio, as some mock slabs made from resin or ceramic may be susceptible to heat damage. Only for use with logs or charcoal. This brazier fire bowl has a simple design which will hold a good sized fire. It is made from mild steel and is built to last. For outdoor use only. Keep children and pets away from the fire bowl when lit. Always position away from buildings on a safe non-flammable surface. If using on a paved patio, place on an additional protective paving stone made from solid natural stone or concrete at least 5cm thick. This will avoid possible discolouration and cracking of your patio, as some mock slabs made from resin or ceramic may be susceptible to heat damage. Only for use with logs or charcoal. is it made of stainless steel or is it liable to rust? Hello, this product is not made of Stainless Steel and if left outside in the elements it will rust. Hope this helps. Can we burn coal in this pit? or only logs? Hello there No I would only use logs in this fire bowl. If you want to burn coal then I would use one of the cast iron braziers. I have attached the links below. http://www.crocus.co.uk/product/_/cast-iron-disc-brazier/classid.2000014001/ http://www.crocus.co.uk/product/_/cast-iron-disc-brazier/classid.2000020658/ Hope this helps. Hello, The fire bowl does separate from the base and it weights approx 3.5kg.